Digitalis ferruginea 'Gigantea' has softly colored, tan-yellow flowers with rusty-brown veins on the inside. It's a tall, narrow plant like an exclamation point in the garden. Rusty Foxglove grows well in part shade, and it's not too picky about the soil. I have a patch growing in the shade next to an old blue spruce - just about the worst conditions you can imagine. This species thrives and reseeds there. Digitalis ferruginea 'Gigantea' is a biennial or short-lived perennial. Hardy in zones 4-9. Deer resistant. 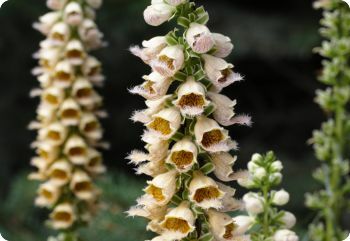 Also see Digitalis ferruginea 'Gelber Herold'.